Question: I'm trying to determine how large (geographically) my city will have to be to accommodate for 1 million people. That's not exactly how the river runs around the city, but the basic idea is that the land spirals from the place where the river enters the city down to where it exits. The city is split by the river into 8 octants, each octant is almost completely identical to the others. In the middle is a huge palace where 8 rulers live, surrounding the palace is the octant "administration building" then immediately out from that is where other normal city buildings are (textile shops, hospitals, etc.). From there you get to people's dwellings. The dwellings can definitely be multi-story apartment-like buildings. They're very effective at building tall/strong glass buildings (their magic system helps with that and the tall palace is evidence of this). The dwellings are arranged so that the people who work in the center of the city first, then people who work further out second. Then you get to the second layer of normal city buildings (so there's an inner hospital and an outer hospital for each octant). Finally you get to a third set of dwellings for the people who work out in the fields (farm and livestock land) and forests which surround the city. This is a world for a fantasy novel where the gods shaped the land to be suitable for this. The civilization is sitting somewhere around the 1800s in our own history as far as technological capabilities. This city is optimized for efficiency, not citizen's enjoyment. So sports and things like that don't have a place here and therefore wont take up space. They use the river to travel and transport goods throughout the city (as I mentioned, the drawing is imperfect because it doesn't really communicate how this works very well). They build most things out of glass (they get the sand from huge sand dunes in the east), but they do use metal (mines in the north) and wood for some things. The trees are within the boundary of the river. The city is completely self-sustaining. With the exception of mines that are out in the mountains to the north and sand dunes to the east (the entire city is built out of especially strong glass to enable the sun-powered magic), everything the people need to survive and thrive exists within the boundary of the river. The people in the city also completely share resources. Everything comes to the administration buildings and is equally distributed. No "class" system. This means that everyone's homes will be the same size relative to the size of their families. 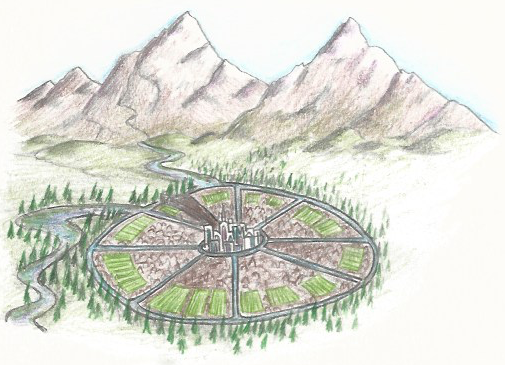 So what I need to determine is what the diameter of the city would need to be to accommodate ~1 million people. How big would the fields need to be in relation to the dwellings etc. I need to know this so I can accurately describe how long it would take someone to travel from the palace to the outside of the city given various modes of transportation (walking, riding in a carriage, and riding on a barge on the river). I found this on farmland necessary to sustain some amount of people: How many people can you feed per square-kilometer of farmland? so using conventional farming (no hydroponics, magic, or crazy stuff), you'd get around 2350 people per km2. Flip it around and that's about 425 km2 for a million people. So, 425 + 715 = 1140km2 which is a circle with a diameter of 38km or 24mi. That's probably a solid start to the problem. You'd probably have to also look up how many farmers you'd need per km2 to help estimate that layer. oh and the average human walking speed is about 3.1 mph so on a clear cross-cutting road, it'd take 8 hours to make it across with no breaks or obstacles. In the picture you provided the fields seem to be enclosed by walls and thereby probably count towards the city size. Fields: For the field size I used this source; according to it, 4 people need 2 acres of land, which is about 8000 m2. This means 2000 m2 per person, times a million, gets us 2000 km2. Rest of the city: I used London at the beginning of the 19th century (at that time it had a million in population) and encompassed 122 miles2 or 312.32 km2. Without consideration for comfort and open space you can look at the list and pick Manila as your model. The highest density city in the world at 119,600 per square mile, you'd need less than 10 square miles for your city of 1million. The thing to note is that Manila isn't really high rise. It's very densely packed low and medium rise with minimal open space. Apartments or houses? Apartments are far more efficient when it comes to regards to their footprint. In the 1800, my guess is that the average household had about 4 to 5 people. Hence, you would need 200,000 to 250,000 housing units. Class system will greatly influence the floor space per each housing unit. My lowest class, get about 40m2 apartment, or a 400m2 plot of land for a house. My 'rich' get 2500m2 plots for their houses. My experimentation yielded that the housing 'efficiency' is between 65% to 75%, depending on class. What this means, is that for 100 poor houses (100 x 400m2 = 40,000m2), you would need an area of 61,540m2. Thad additional area is for your roads and streets. My previous research yielded that a loaf of bread needs 1m2 of field space. A cow and a calf need about 1ha of grazing space. A chicken would need only 4m2 of space. Not the answer you're looking for? Browse other questions tagged geography cities population city or ask your own question. How many people can you feed per square-kilometer of farmland? How does one design a city meant for creatures of greatly varying sizes? What would be the state of decay in an abandoned city? What factors determine how tall the buildings in a city will be? Would it be possible to build a city out of only oxygen, silicon, aluminum and iron? What's necessary for this stratified, flood-prone city to be plausible? How would you redesign and revamp the city transit system?